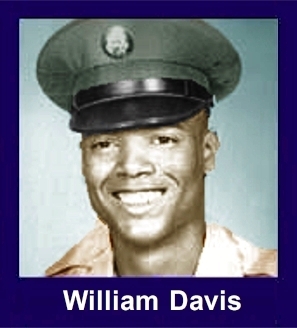 The 35th Infantry Regiment Association salutes our fallen brother, PFC William Louis Davis, who died in the service of his country on January 20th, 1967 in Binh Dinh Province, Vietnam. The cause of death was listed as Small Arms/AW. At the time of his death William was 19 years of age. He was from New York, New York. William is honored on the Vietnam Veterans Memorial at Panel 46W, Line 48. The decorations earned by PFC William Louis Davis include: the Combat Infantryman Badge, the Bronze Star with V, the Purple Heart, the National Defense Service Medal, the Vietnam Service Medal, the Vietnam Campaign Medal and the Vietnam Cross of Gallantry with Palm Unit Citation. For heroism in connection with military operations against a hostile force: Private First Class Davis distinguished himself by heroic actions while serving as a Machine Gunner with the Reconnaissance Platoon of the 1st Battalion, 35th Infantry, which was on a search and destroy mission in Binh Dinh Province, RVN. Moving up a hill through heavy underbrush, the platoon was brought under intense automatic weapons fire from a sizeable enemy force in fortified positions. Private First Class Davis unhesitatingly began an assault on the enemy, placing a heavy volume of fire on their position with successive firing on his machine gun as he advanced. During his attack, continually exposing himself in order to render effective fire, Private First Class Davis was seriously wounded. Realizing the gravity of the situation, Private First Class Davis removed the trigger housing group from his machine gun and hid it beneath his body so that if the gun was captured it would be of no use to the enemy. Private First Class Davis' aggressive assault and exceptional concern for his comrades was a true inspiration to the members of his platoon and proved to be a decisive factor in seizing the objective and expelling the enemy form their fortified positions. Private First Class Davis' outstanding display of determination, devotion to duty and personal bravery is in keeping with the highest traditions of the military service and reflects great credit upon himself, his unit, and the United States Army.